Its back to the jungle again , after that horrendous time I had in the hospital. Some one called me the Little Prick... Victim !! Work stalled while I was away, and I was anxious to start the ball rolling again at work. One more site to install , Taman Negara, clean clean waters, and lots of ikan kelah !!! So work took us right to the brigde where the 4 day journey to Gunung Tahan begins. I was at Gunung Tahan's base camp. Make not mistake, this is Tmn Negara , Merapoh, not Kuala Tahan. You won't find 5 star accomodations, restaurants, lots of tourists here. 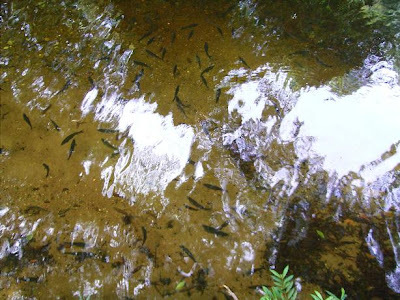 Instead you find crystal clear waters, cool, quiet and peaceful camp site. 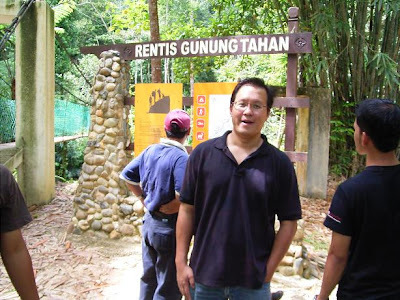 This is also the site where they have the Kelah Sanctuary. The ikan kelah is the most sought after fresh water fish locally. So much sought after that it is now almost extinct. When you enter the park gates and register yourself to enter this park at the ranger's office, you would have walked past their aquariums where they have Kelah's that weigh up to 8kg. You can't miss it.... over here you get to see the Kelah swimming in the wild. 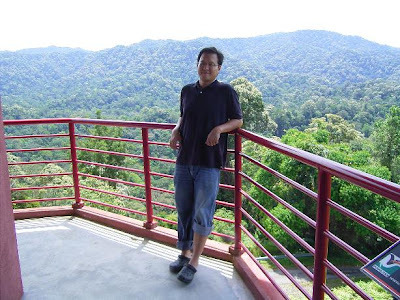 Next stop was the observation tower where in the background is the Gunung Tahan peak. Unfortunately for us , most wildlife was already sleeping or resting in the heat of noon. 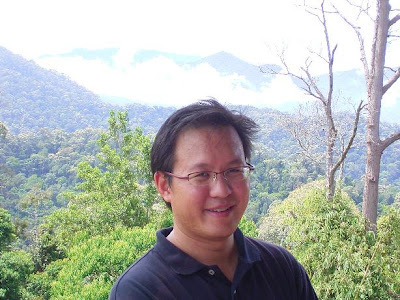 According to Park Ranger Azmi, most wildlife wake up early in the morning , rest by Noon, or wake up close to sunset and play until late morning. From this platform, we should be able to hear them hunting, eating , doing their wild activities, etc. We managed to see Elephant treks along the road we were travelling on. The river we were allowed to install our sensors is one of the spots the elephants play. I was quite surprised to find out that we rarely spot elephants during the day. They are mostly nocturnal animals. hmm.... what about those elephants in the zoo ? CCC , and CC will be served for CC's potluck dinner. We began at about 130pm after lunch. 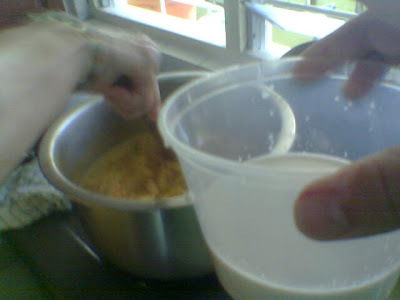 We started by beating the butter until it becomes fluffy, then we put in the egg. Thats where all the hard work is actually. 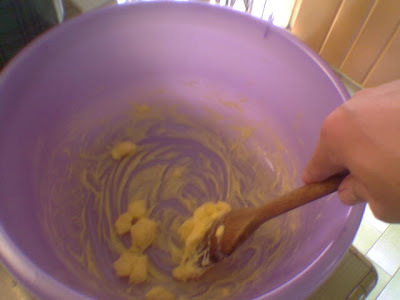 I was doing it for a good 20 minutes, when the mix is well done, we put in the dough mix. Wah, I am already having a good workout. It took us another about 10-15 minutes before the dough is wrapped. By now the dough is choclately sticky. The blend was quite sweet I thought. Next time will definitely try to make own dough and will remember to make it less sweet. Sayang thought it was too sweet , Sayang's dad thought it should be the way it is. Then we put the cookie dough into the baking tray. Lined with baking paper. 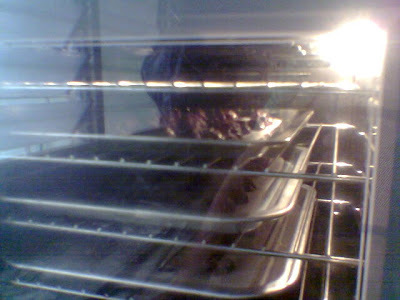 Heated the oven up to 180C and we put in the cookies to bake for 10 minutes. After 6 minutes we could see the cookies beginning to flatten. When we took the cookie trays to turn them around , I had the idea of putting M&Ms on top of them. 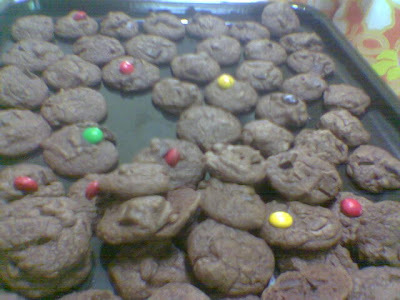 Not knowing whether the M&M's will turn out nice , we only put in a few. That also because we put it in, while the cookies were getting baked. So everything turned out quite nice, except that sayang was complaining it was too sweet. The crab curry was later. The raw ingredients, were, fish curry paste, all the different spices, and fresh crabs. Hmm this dish was cooked by Sayang's mom, I was there to take pictures and curi makan sahaja. So here are the before pics. The spices are being fried before the curry paste and chili mix was put into the pot. 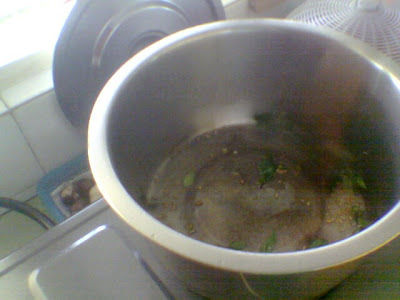 After the chili mix and spices are cooked, we put in the watery santan and the crabs to cook. It was simmered for about 10 minutes . 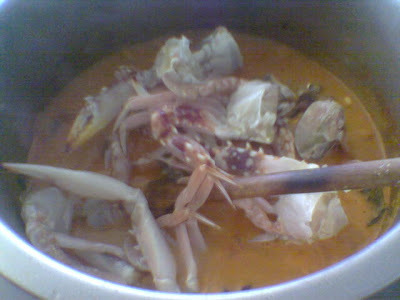 After about 15 minutes, of simmering, and moving the crabs around to ensure that the crabs are cooked evenly. 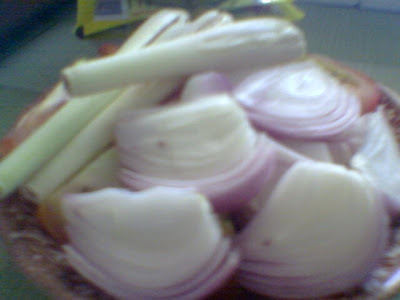 Sayang's mom, took out the finishing ingredient. Santan Kelapa kao kao. After she put it in, the lid was closed and left to simmer for another 10 minutes in low fire. The final result was superb. By the time the stove was switched off, fresh crab curry aroma filled the entire house. Lovely aroma, and the taste is of course quite superb. Sayang and I had the pleasure of trying out Patrick's Steamboat place somewhere in Kampung Kayu Ara. 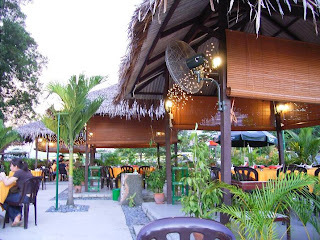 Its Damansara Seafood Village. Coincidentally, in today's Sunday Mag, this place was featured in the food section of the publication. I must say I did see the pictures from their website, the restaurant looked really classy, picturesque is more like the word to use here. I was there for the first time, and it looked like any other steamboat restaurants you can find in Manjalara, or in Cheras Business Center. The only difference is that, is has got huts in and around the place, other wise it is open air dining. We went early, reached at about 7pm, to beat the crowd. I snapped a few pictures of the restaurant. It came out really nice, I mean, the pictures make the place look a lot nicer than in real life. Al Fresco dining was the words Patrick used to describe this setting. This place is lacking in air conditioning, or fans around the place. If they had vapour fans all over the place, then it would have been a lot more enjoyable to eat. I basically began to sweat the moment we sat down, to the moment we left. 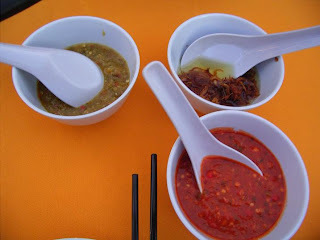 The usual stuff can be found on the table, Chili Sauce, Onion Oil, and Ginger Chili mix. So when we sat down, a nice fella came over to take our orders. He placed two nicely laminated menu for us to look at. Took our drinks order and left us alone to go through the menu. 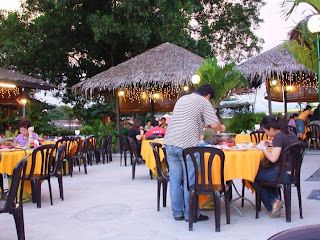 When he came back, he suggested we try their seafood set, for 2 pax.. RM59.90 nett. 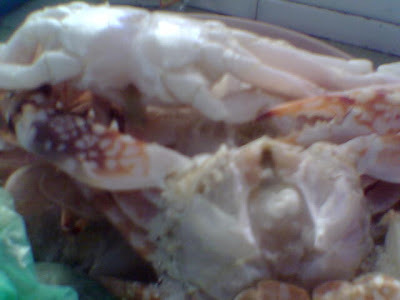 In this set you get 1 person standard serving, 200gms of prawns, Clams, and 2 flower crabs. 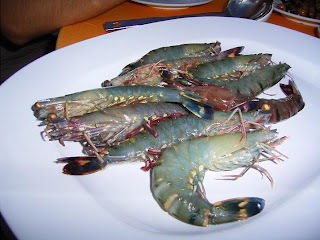 They boast of serving only swimming seafood over here, and I must say their seafood is quite fresh. I was okay with most stuff except for their clams. 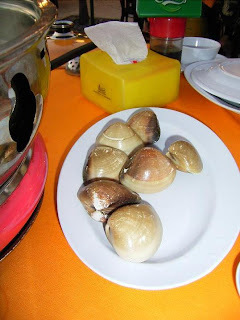 Make sure you cook them for 3 minutes in boiling water minimum. Smelly wan !! The dining experience was the usual steamboat one. Nothing special over here. You don't get Patrick dancing for you or singing or anything like that. However, I did notice, how brisk business was. By 730pm, the restaurant was full already. By 745 pm, you already have a 30 minute waiting list. I ordered lemon lime, while sayang was slowly korek-ing her coconut after she had enough to eat. 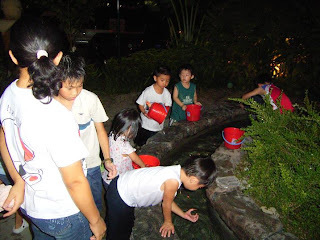 By 8pm, quite a number of kids could be spotted at the fountain near the entrance. I was wondering if they were actually fishing for their food. 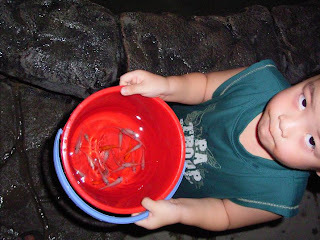 Oh, longkang fishing really did keep the kids occupied. My friend down there had the biggest catch of the day. 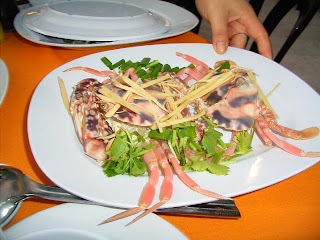 When you come over to this place, you have to try the different types of seafood stuff they offer. 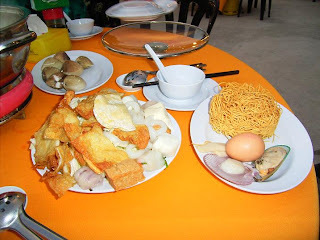 Don't just order the normal steamboat stuff. Why ? You will find it pricey and not special. If you tried their seafood set, at least the money you pay, you get to eat some real seafood, freshly cooked in front of you. Oh ya one more thing, parking can be a hassle here, plus, If you want to come late, please make reservations. off Jalan SS23/10, 47400 Petaling Jaya. Open for Dinner 7 nights a week.